Paulownia is a genus of between 6–17 species (depending on taxonomic authority) of plants in the monogeneric family Paulowniaceae, related to and sometimes included in the Scrophulariaceae. They are native to much of China (its name in Chinese is 泡桐/pao1tong2), south to northern Laos and Vietnam, and long cultivated elsewhere in eastern Asia, notably in Japan and Korea. They are deciduous trees 10–25 m tall, with large leaves 15–40 cm across, arranged in opposite pairs on the stem. 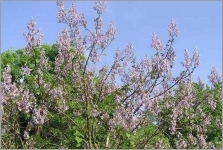 The flowers are produced in early spring on panicles 10–30 cm long, with a tubular purple corolla resembling a foxglove flower. The fruit is a dry capsule, containing thousands of minute seeds.